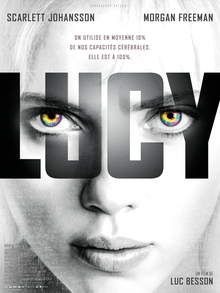 It's very obvious that Luc Besson draws his influences from Franco-Belgian comic strips and Japanese manga/anime. Just yesterday afternoon, I was watching an anime which used the 'person morphing into weird black tubes' trope. The question is, can Besson's totally fantastical plots stand the transition to real people and settings? Was there anything buried here for the skeptical magician to get her teeth into? Well, it is quite impressive how we humans have such an intense awareness of the quantity and shape of our ignorance. In a way, it's as interesting as animal self-consciousness, but less well researched as far as I know. Can a dolphin discern the existence of unexplored land masses and wonder what they're like? Can a symbol using chimpanzee note our use of symbols it doesn't understand? Does it realise that another chimpanzee knows things it doesn't? I have no idea, but we can do all those things and more. No wonder we have a perpetual sense of limitation when we see beyond our limits all the time. And no wonder we're able to imagine the limits being lifted.